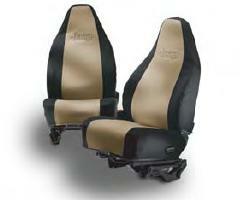 Seat Covers for the Jeep Wrangler are custom tailored for a perfect fit and do not block seat controls. Comfortable yet durable fabric matches your vehicles interior color while protecting original upholstery from dirt and tears. Easily removable for washing and feature vehicle logo. On all 2005 & 2006 models please check bottom of rear seat for carpeting. If no carpeting is found, seat covers will not fit properly. The 82209530, attachment kit was needed but has been cancelled by Mopar. KHAKI COLOR IS NOT AS PICTURED. MORE OF A GRAY COLOR.